The FirstIn Pfoundation is dedicated to promoting safety and expanding response to meet the needs of the community and first responders. Firefighters are dedicated professionals who every day make a decision to serve our community and go the distance to ensure our safety. Whether they are conducting education, ensuring fire safety code compliance or responding to an emergency, their indisputable commitment is a testimony to being a special breed of people. The firefighting profession is one with risk. Firefighters face perilous dangers associated with entering burning structures and exposure to hazardous materials, infectious diseases, and deadly byproducts in smoke. As part of the Pfoundation’s mission, the Pfoundation works with TCESD No. 2 to find avenues to raise additional funding for appropriate training, technology, tools, and equipment to minimize these risks. Public education and awareness is also important to the community’s safety. The Pfoundation’s mission includes providing aid to assist with education and prevention measures to diminish these risks. In 2012, the area served by TCESD No. 2 had 57 brush fires and the risk continues. Wildland fires require unique vehicles that can easily negotiate terrain and be self-reliant. Brush trucks offer these functions as well as the ability to pump water while the apparatus is moving. Because of their ability to negotiate various terrain, brush trucks are also used during rescue operations. TCESD No. 2 has two brush trucks that should be out of service as their full functionality is outdated. You can help the Pfoundation raise funds to replace these outdated brush trucks with ones that are fully functioning and reliable. The Pfoundation’s first fundraising effort will focus on raising funds for the purchase of brush trucks. We invite you to join us on Facebook at FirstIn Pfoundation for updates. 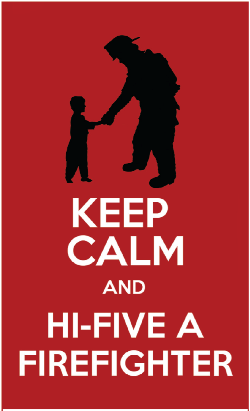 Join this effort, Keep Calm and Hi-Five a Firefighter, and give $5 for the service provided by firefighters 365/24/7.